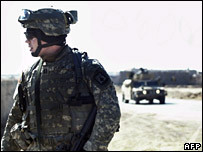 The US military has appealed to scientists to help develop a novel weapon - artificial black ice. The plastic-like substance, the brainchild of the US Defence Advanced Research Projects Agency (Darpa), would be used to force slip-ups from enemies. The "polymer ice" would be designed for hot, arid environments, "as found in Iraq and Afghanistan", it said. A spray-on "reversal agent" could be incorporated into boots and tyres to prevent friendly forces sliding around. In a document published on the agency's website, officials point out that "to get from point A to point B, one must have sufficient traction with the ground". Darpa believes a polymer-based compound could replicate the properties of black ice - a thin, translucent slippery coating, typically found on roads in winter - to reduce traction. The agency's wish list for the "Mobility Control System" includes the polymer ice or raw materials to produce it very quickly, a spray-on reversal agent and a means to clean the ice up. "Such a system will provide unprecedented situational control and sustained operational tempo," said Darpa. "It would degrade the ability of our adversaries to shoot and chase us." Researchers interested in joining the Polymer Ice Project are being invited to respond by the middle of April 2007.